Irish import Intelligence Cross will have his first start for trainer Matthew Williams at Caulfield. One of a trio of sprinters Irish trainer Aidan O’Brien brought to Australia last spring is set to have his first start for Warrnambool-based Matthew Williams. “I thought he went OK knowing full well that he wouldn’t have been fully wound up, but he ran through the line quite well,” Williams said. “And apparently he had quite a few feet issues when he came out as an import at the quarantine centre. “His feet are in really good shape now and the farriers have done a really good job with him. Williams is setting Intelligence Cross for Warrnambool’s major sprint race, the Wangoom Handicap, during next month’s three-day carnival. 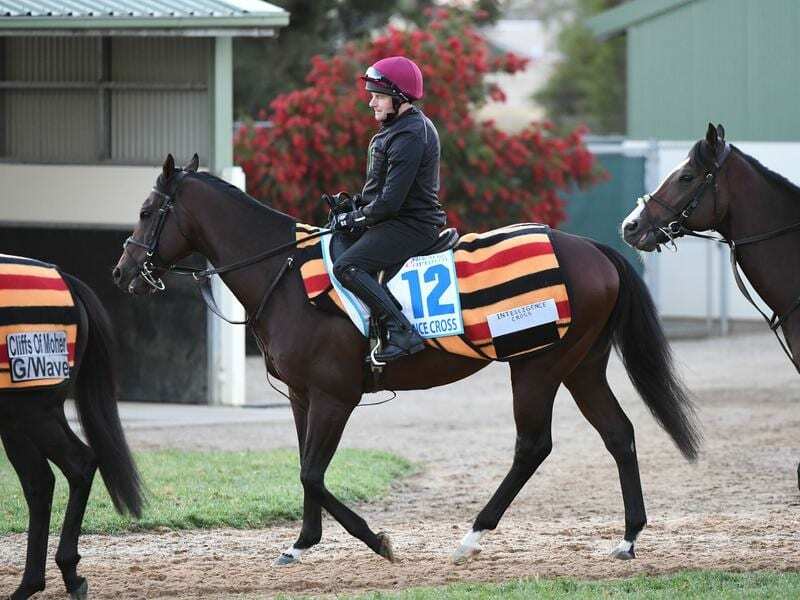 His recent trials have been solid with Williams saying the five-year-old is ready to “rock ‘n’ roll”. “The plan is to give him this run and have him ready second-up for the Wangoom,” Williams said. “He won a trial at Camperdown on Monday but I think 1200 metres will suit him better than the 1100 on Saturday. “If he’s running within three lengths of them on Saturday I’d come away pretty happy knowing there’s some improvement in him for the Wangoom. Williams has taken the sprinter to trial three times in the lead-up to Saturday’s return and was surprised by his antics a fortnight ago. “He’s a lovely little horse and I was surprised when he kicked out in the gates and carried on, so we ended up not trialling him,” Williams said.